The Shih Tzu stands about 8 to 11 inches tall and weighs from 9 to 16 pounds – a real miniature breed dog. 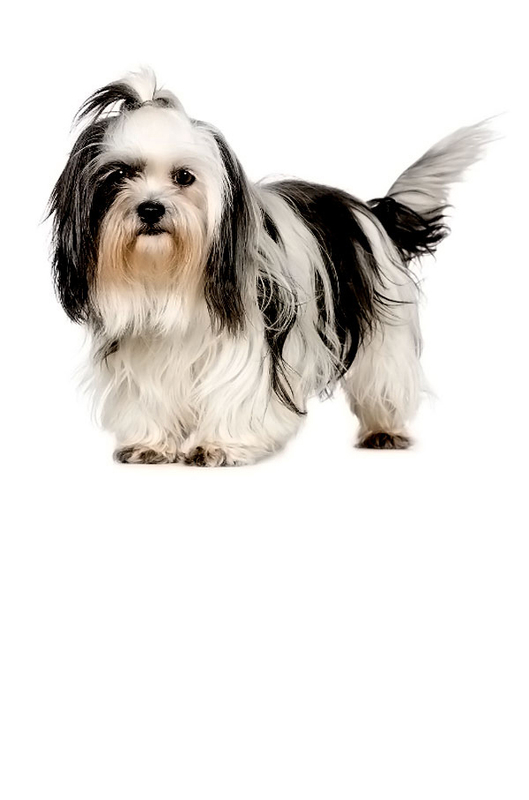 Grooming-wise, the Shih Tzu does not shed so much, making it a good match for people with dander allergies. Still, the dog requires regular grooming. This brachycephalic (flat nose and muzzle) dog breed is originally bred as a family companion. It thrives in affection and returns it a hundred folds. On the downside, the Shih Tzu can also be a skittish creature and may not be as tolerant with toddlers if not raised with them while young. Regardless, the Shih Tzu is a delightful mild lapdog. This dog has a lifespan of 11 to 16 years. 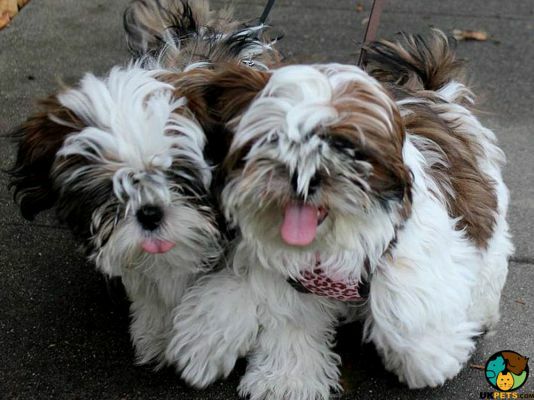 Are you thinking of getting a Shih Tzu? Here is a brief background of this hairy pooch called the Lion Dog. There are varying theories behind the origin of the Shih Tzu. According to a recent study, it is one of the oldest dog breeds whose ancestors existed since 8000 BC. Its DNA analysis indicates it is a close descendant of wolves. 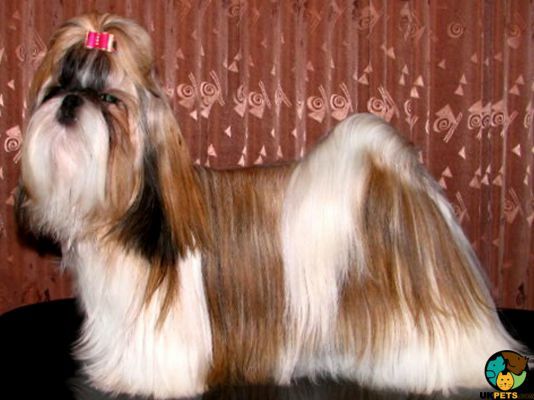 It is believed that this breed was developed by Tibetan monks in China by crossing the Pekingese and Lhasa Apso. Lions are usually associated with Buddhism but since they were not indigenous in China, they bred the Shih Tzu, which literally means “lion dog.” These “lion dogs” with chrysanthemum-like facewere given as gifts to Chinese royalty and became cherished companions. In 1861, the breed became popular in the Imperial Court because of Empress T'zu Hsi, who was an animal lover. She developed extensive breeding programs and received a pair of high quality Shih Tzus from the Dalai Lama. In the early 1900s, royal families competed secretly to produce various coats and colours of this breed. 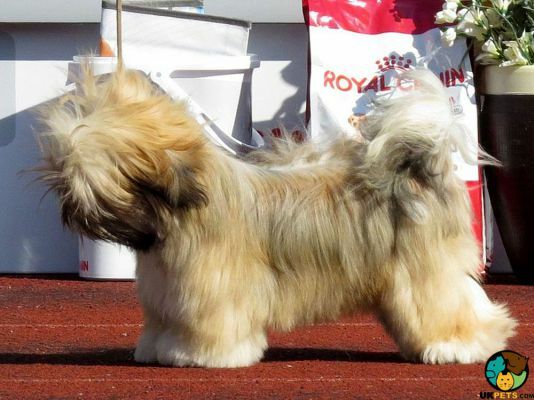 The first pair of Shih Tzus arrived in England through Lady Brownrigg in 1928. The Shih Tzu Club of England was founded in 1934 and the breed was officially recognised by the Kennel Club in 1940. 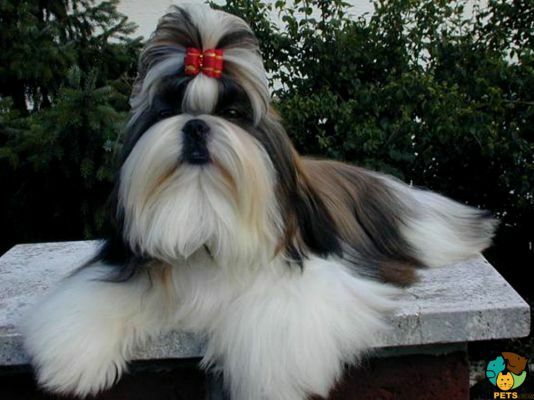 The Shih Tzu is a confident- and sturdy-looking pooch. It weighs between 9 and 16 pounds and stands 20 to 28 centimetres at the withers. It has a broad and round head with large dark eyes and big ears. It is known for its beautiful beard and whiskers. The hair on its muzzle grows upwards, which gives it is chrysanthemum-like face. 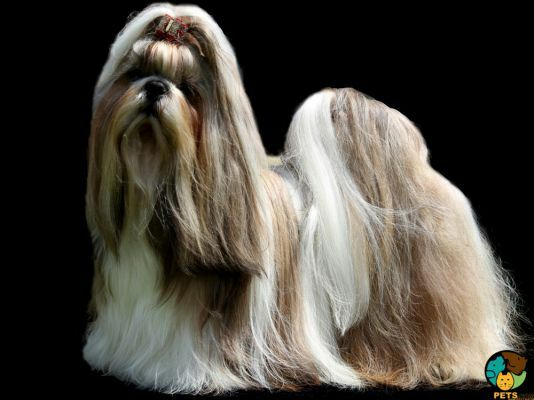 The breed is distinctively known for its long and silky coat that comes in various colours and colour combinations. It usually comes in black, black and white, gold and white, brown and white, liver and white, and red and white. Merle is considered highly undesirable. Its fine and soft coat is considered hypoallergenic. However, maintaining its gorgeous locks takes a lot of work. Owners need to brush its hair, which should be done in sections, a few times per day to avoid tangles. Bathing should also be done at least once a week. It is advisable to take it to a professional groomer that knows how to handle its hair needs. Should you decide to clip it short for easy maintenance, it should be done very six to eight weeks. The Shih Tzu’s silky coat locks may require full attention but its nails, ears and other parts also need a little dedication. Its nails should be trimmed regularly, ears checked weekly for dirt or signs of infection and teeth should be brushed at least twice or three times a week. 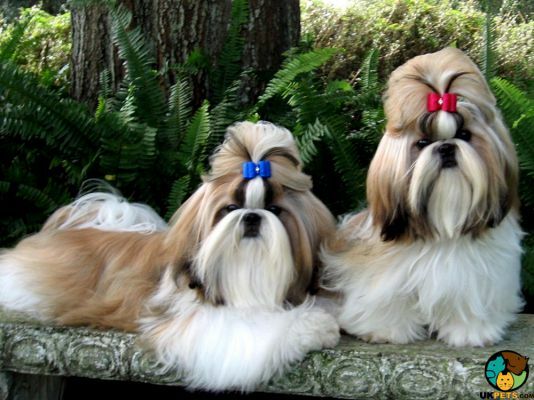 Aside from its charming appearance, Shih Tzus are popular because they are loving, devoted and affectionate companions. As an adaptive breed, they can live in an apartment or a suburban home. They are clingy and love being in the presence of their owners. They are indoor dogs and should not be kenneled outside or left for long periods as they can get depressed. They are a great family pet that love children. Make sure interactions with very young kids are supervised so the dog won’t be dropped or injured. Unlike other friendly toy dogs, they are alert and may bark at strangers. Nonetheless, they are not guard dogs so they will easily make friends with visitors. The Shih Tzu is intelligent but tends to be stubborn when it comes to training. It can be difficult to house train. Since it is not a naturally active dog, its training should focus on basic commands and socialisation. Consistency and positive reinforcement consisting of praises and treats will help. Each dog breed is unique despite its pre-disposition in terms of intelligence and temperament. Genetics, environment, early socialisation and training play a big role in shaping its personality and abilities. A typical serving for an adult is 1/2 to 1 cup of excellent quality dry dog food per day. However, like in every breed, the amount of food depends on its age, size, build, activity level, and metabolism. As a dog owner, see to it you to understand the basic nutritional needs of your Shih Tzu as a breed while still considering its individual characteristics. Since Shih Tzus have a tendency to become obese, their diet should have less carbohydrates and more protein. They should have lean proteins like chicken, turkey and eggs. Another lean source of protein, which includes good fats for healthy coats, is fish. Complex sources of carbohydrates are your best options to maintain its healthy weight such as oats, barley, sweet potatoes and rice. Like most small dogs, the average lifespan of the Shih Tzu is 12 to 16 years. It is generally healthy but predisposed to certain health conditions. These are Hip dysplasia, Hypothyroidism, Patellar Luxation, Juvenile Renal Dysplasia, Reverse Sneezing, Umbilical Hernia, and Portosystemic Liver Shunt. Because its eyes are big and bulging, they may suffer from Dry Eye, Keratitis, Ectopia Cilia, Distichiasis, and Progressive Retinal Atrophy. They can also get bladder infections, ear infections, and mouth problems like snuffles, retained baby teeth and gum problems. The Shih Tzu has minimal exercise needs. To maintain a healthy body and mind, have a 30-minute walk or games of fetch at a fenced backyard daily. Do not leave it outside for too long because as short-faced dog, it is prone to heat stroke. 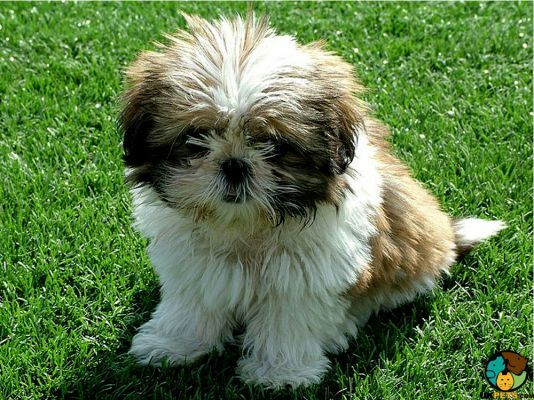 It is but practical to know how much a dog owner will potentially pay for getting a Shih Tzu. Dog ownership is, after all, a huge responsibility. It is also a significant purchase considering other related costs that come with raising it. A puppy will cost around £400 - £1000. Pet insurance will have you shell out £19 - £40 a month depending on several factors that insurance companies consider. Other costs include food which is about £30 - £40 a month, veterinary costs for health checks which may cost over £800 annually. If you look at it on a monthly basis, you will spend roughly about £60 - £100. This cost estimate excludes special veterinary treatments for health issues. The Shih Tzu is a small but strong and sturdy dog. It does not require a lot of outdoor exercise. It sheds less than other breeds and is hypoallergenic. Prone to health problems associated with its short face. It is a housedog and can live comfortably in city apartments. It is a mildly stubborn dog and is difficult to housebreak.